Who doesn't need a little more glitter in their life? 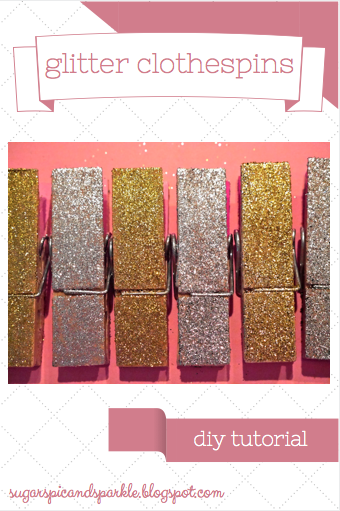 Follow this simple step by step tutorial to add some sparkle to today. First gather your supplies. You will need clothespins (any size will do, mine were shorter and chunky-er than the classic clothespin), paint, mod podge, brushes, and of course glitter. Head to the bottom of the post for easy links to what you need! Decide which color combo you think will look best. I had silver, gold, and black glitter and decided pink would go perfectly with any of these (let's face it is there anything pink doesn't go with?). Paint the inside of the clothespin with your paint. This step isn't really necessary but why not add a pop of color when you get the chance? Next coat the outside with a thin layer mod podge (one side at a time) and sprinkle glitter on top. I used another brush to spread out the glitter but if you want to use a different technique then go right ahead! Make sure you really do use just a think coat of mod podge or you may end up with a goopy mess. Finally you'll want to use some glossy spray to make them extra shiny and also help keep the glitter at bay! If you skip this step be prepared to have fingers full of glitter every time you use the clothespin. Let that dry and you're done! Now figure out where you want to use these pretty babies! Stick a magnet on the back and use them to hold pictures on your fridge, stand them up on your desk for decor, keep papers together and in style! The choice is yours and you can't go wrong with glitter. Share a picture of yours with me on Instagram - just tag @sugarspiceandsparkle - I'd love to see what you created!